When you’re making games, knowing how to stay motivated and focused is important. Motivation is a HUGE determining factor for success. However, when you’re a solo indie dev making games only in your spare time, finding the motivation to see your game project through can be difficult. The simple truth is it’s hard staying motivated. Life is always happening. It’s easy, especially for new game creators, to get distracted, overwhelmed, or completely lose interest and end up abandoning their game. For most indie developers, the first game is actually the hardest one to make. This is why knowing how to stay motivated and focused is so essential when you’re making games. All the tools, strategies, and resources in the world are useless if you don’t have the momentum to follow through. So, how do you stay motivated as an indie game developer? Well, there are six strategies that you can apply to help you stay motivated to finish your indie game or any big project that you decide to take on. These techniques when practiced will make it easier for you to stay focused on exactly what you want to achieve. If you want to know how to stay motivated, you first have to know your why. As the great late entrepreneur and motivational speaker, Jim Rohn once said, “When the why is clear, the how is easy.” Understanding your ‘why’ is a major step to accomplishing any goal. When you know it, you can use it to channel your motivation. Take some time to think about it. Try to find your real motivation. Maybe since you were a little kid, you’ve always dreamed of making your own game. Or it might have been a particular game that inspired you to get into game making. Are you making games to achieve financial freedom and quit your day job? Do you enjoy making games and do it just for fun? Dig deep and record your why. Once you’ve written down your reason, you’ll want to use it as a reminder. Remember, your ‘why’ is not only your reason it’s your motivation. Save your ‘why’ on a piece of paper, index card, post-it note, or on your phone. Make a reminder notification on your phone with your ‘why’ to pop-up periodically or after so many days has passed. You can place your ‘why’ for making games on a post-it note on your computer or set it somewhere on your work station. Jot it down on your calendar. It doesn’t matter which way you do it, as long as you make it visible and accessible to you. When you’re making games, and you feel like quitting, all you have to do is look at that index card or post-it note, and you’ll remember why you started. This small but simple tangible reminder will keep you going when things get tough. To keep motivation and productivity up, it’s also important to set game development goals. Ideally, you’ll want to do this early on when you’re making a game. Setting goals and prioritizing them will also help you to stay motivated to finish your game. There are three different techniques that you can use when you’re setting your game development goals. The first technique is K.I.S.S. (Keep It Short and Simple). When you keep your goals short and simple, it makes them more doable. Try to start out small and work your way up. It’s paramount that you avoid taking on more than you can handle. Taking on too much at once is one of the biggest motivation killers. So, avoid this altogether by keeping your goals simple and very precise. Focus on just the core plan that would be necessary to create a working prototype of your game. Don’t flood your goal/task list with every single idea or feature you have in mind. Remember, you can always add things later to change or build up your game as you progress. That’s what the polish phase is all about. In the beginning, start small. Keeping your goals small and specific will give you laser-like focus allowing you to check off all the tasks on your to-do list quickly. Breaking down your goals into manageable steps is the secret to tackling any big project. When you’re making games, there’s a lot you need to do. So, it’s essential that you also break down each task into smaller actionable steps. For example, one of your game development goals might be to ‘make the art for your game.’ Although it sounds simple enough, that’s a huge goal. It implies that you’re making the art for your entire game. Which means you’ll have to come up with the color combinations, decide which tool to use, make the background art, create the objects, enemies, platforms, main character, menu art, UI buttons and all the unlockable characters if any. There’s no way you can do that all in one go. Always break it down. You’re setting yourself up for failure when you make large goals that aren’t realistic or attainable within your time constraints. For each task that you want to accomplish, you need to break it down until it’s short, specific, and actionable. 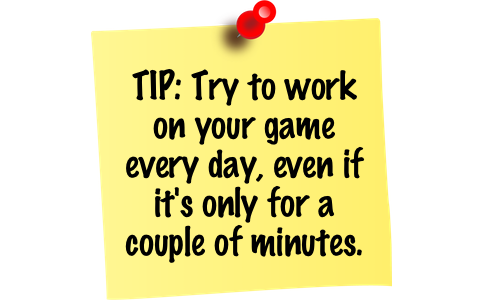 To get started, get out a piece of paper and start writing down all of your to-do’s for your game. Look over your list and ask yourself, could this be broken down even further? If so, then do it. Continue to break it down until you have a list of simple but actionable steps that you can tackle each day. The third technique focuses on prioritizing your game development goals and tasks. I like to refer to this as the ‘Divide & Conquer’ method. When you’re breaking down your goals into actionable steps, it’s important to prioritize them. With this strategy, the goal is to divide our tasks and organize them in a way that will help us stay motivated as we work to complete each one. We’ll do this by rating our tasks in two different areas: fun and difficulty. Let’s start by reviewing our list of goals or tasks for completing our game. Based on a scale of 1-10 with one being the least fun and ten being the most, examine each job and give it a ‘Fun’ or ‘Enjoyment’ level rating. Now, based on the scale of 1-10 with one being the easiest and ten the hardest, examine each task honestly and give it rating of difficulty. This will be different for everyone. You may be great at making your own game art and can easily make images or characters in Photoshop, but it might be difficult for you to come up with unique gameplay mechanics or vice versa. Consider your skill level, what you’ll need to learn or do, and the time constraints involved. Over or underestimating what you can do and how long it will take, is one of the most common mistakes people make. Nothing is worst than getting to a point in your game development process and realizing you don’t have the time or skill to complete the task. Having a clear idea of what’s required and what you’re capable of is critical if you want to succeed. Once you have your tasks prioritized by difficulty, review all the goals with a difficulty rating of 5 and up. Determine whether or not it’s possible for you to learn the skill necessary to accomplish it or if you’ll need to enlist help. Just because you’re a solo dev doesn’t mean you have to do everything yourself. Hire an outsourcer to do any task that you’re not able to whether it’s due to skill or time constraints. Outsource sites like Upwork, Freelancer, and Fiverr are great places to find help. Now that you know which goals are attainable and the level of difficulty or fun involved, it’s time to start mixing things up a bit. If you want to stay motivated, you have to be passionate about what you’re doing. The same applies to making games and the goals that you set. Unfortunately, not every aspect of game development is exciting and some parts are just downright hard. To keep yourself pumped, you have to mix things up when you’re scheduling your game dev sessions. Instead of just going down the list, you can arrange your to-do’s so you’re never doing a task that you don’t enjoy for too long. Try to tackle the hardest tasks first based. We tend to procrastinate when it comes to tasks that are either difficult or boring. So, break up those days with easier high ‘fun level’ tasks to help keep things interesting. If possible, avoid scheduling tasks that you find mind-numbing back to back. You can use any method for scheduling that suits you best. Whether it’s a calendar, reminder app, planner, or an advanced to-do list app like Things or Todoist, there are lots of great options available. Always take the time out to schedule your game development. It’s the best way to stay on track and maintain your momentum to follow through and finish your game. Remember, there are only so many hours in a day, so being able to make the most of your time is important. Another way to stay motivated when you’re making games is to get involved in the gaming community. Join game development forums like GameDev.net, TIGsource, IndieDB, Buildbox, and Reddit. Participate in the discussions and visit them frequently to get ideas, ask questions, and see what other developers are doing. Forums are great sources to find inspiration. Try to join gaming based forums as well. Choose several gaming platforms that you’re interested in and find forums related to that genre. Get active on social networks like Twitter, Facebook, and YouTube. Follow other game developers, gamers, and game reviewers. Read their posts and watch game reviews and game development tutorials on YouTube. You can also listen to gaming and game development podcasts to help get you in the zone. Make it a habit to search for game dev inspiration daily. There’s always something there if you take the time to look. Also, keep up-to-date on the latest gaming and industry news to help you stay in-the-know. You’ll be surprised how much you can learn. When you’re immersed in the gaming scene, it’ll fuel your passion for making games. It’ll be easy to stay motivated and focused on making your own game when you’re learning about other games and developers on a regular basis. Last but not least, play a lot of games. It may sound counterproductive, to be playing instead of making games but sometimes it’s the best way to get motivated. Try to download the latest mobile games or top games on the platform you enjoy on a regular basis. You can even play classics like Super Mario Bros, Tetris, or Zelda that you haven’t played in awhile. Always try to play new or different style games to spark your creativity and get you excited about making games. Turning your game development into a game or gamifying your game dev is also an excellent way to motivate yourself to continue working when you don’t feel like it. There are two cool ways that you can do this. You can come up with your own game and reward system, or you can use an app like Habitica to gamify your game dev. Habitica also known as HabitRPG is a free app that allows you to turn your to-do tasks into a game instantly. It simulates a pixel RPG with monster characters, gear, prizes, and even the occasional boss fight. When you make progress on your goals you’re rewarded with points and prizes. It features a mobile app and chrome extension allowing you to play on-the-go and on your desktop. Habitica an excellent tool to use to stay motivated. If you’re more of a do-it-yourself type, you can create your own game. 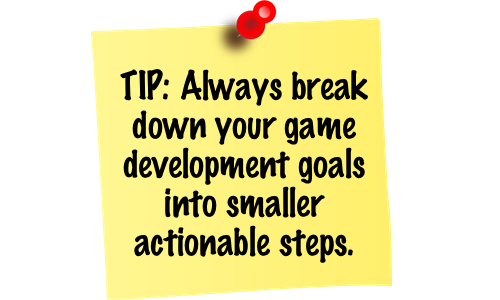 Simply look over your game development goals and select specific checkpoints. You can pick any task or group of tasks that you like. Maybe when you design three unlockable characters, you earn a reward or point. When you’ve accumulated enough points, you can reward yourself with something that you’ve been wanting or a fun activity. This way as you progress along in your game development you’re having fun treating yourself. It’s completely up to you how you choose to gamify the process. Do something else, other than making games. Working non-stop on a project can often lead to burnout and kill your motivation. To prevent this from happening you need to schedule breaks. Take some time to relax and unwind. Try to avoid reaching the point of mental exhaustion or frustration by working breaks and days off into your schedule. The best thing you can sometimes do when you’re making games is to stop and do a different activity for awhile or maybe even for a day. What is relaxing for some may not be for others, so try to focus on activities that you enjoy or find therapeutic. Listen to your favorite music, workout, take a nap, watch a film, bike, meditate, go for a walk, game or whatever works best for you. You can schedule 30-minute breaks or longer sessions lasting several hours. Don’t be afraid to step away from your game when necessary to help clear your head. Taking breaks is good. Just make sure you always come back to it. To help stay on task, you can set your phone’s timer or a reminder notification, so you’ll remember to start back working on your game. Start Making Games – Just Do It! Taking action can fuel motivation. It sounds simple, but it’s very true. If you want to be successful in game development, you have to make making games a priority. Add ‘working on your game’ into your schedule and make the time. The only way your dream of making games will become a reality is if you take action! Email our support team at support@buildbox.com and they’ll help you. Great read and inspirational great job. haha Shia LaBeouf awesome. I have decided to stay away from gaming including buildbox not because building game is difficult or lost of ideas but for its simply I don’t know how to bring the right graphics to make the game come to life.